Every year my mom makes besan ladoo for diwali occasion. This time I wanted to try the ladoo with my mom's version.The unique taste of these ladoo is they are crunchy and does not stick to your teeth, when you eat them. 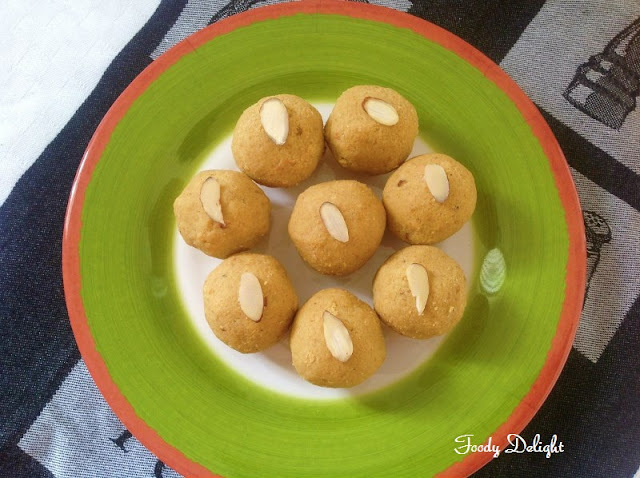 These ladoo are prepared from scratch that is firstly the dal is dry roasted, then it is grounded into fine powder and again the powder is fried into the ghee.So they are more flavourful than ladoo prepare by plain besan flour. The best thing of these besan ladoo is they stay fresh upto month.You all can try it and enjoy these delicious Ladoo. Dry roast the channa dal till it slightly changes its colour. Take out the dal into one plate and allow it to cool down. Once the dal cools down, grind it to the fine powder. You can grind the dal in the mixer in the batch wise. Heat the pan and add 1 tbsp of ghee and chopped cashewnuts . Fry till the cashewnuts slightly changes its colour. Remove the cashewnuts in the plate and in the same ghee, fry semolina for 2 minutes. In the same pan, add first batch of fine powder and fry till the powder is light brown in colour or till you get the nice fragnance from the mixture . You can add more ghee if needed. Take out the mixture into same plate of cashewnuts. Then again repeat the same with second batch of the powder and take out the mixture in the same plate. Add powdered sugar and cardamom powder into the fried mixture and mix well with the spoon because mixture will be too hot. Once the mixture is hand bearable, add remaining melted ghee and mix well . Now the mixture is ready to make ladoos. 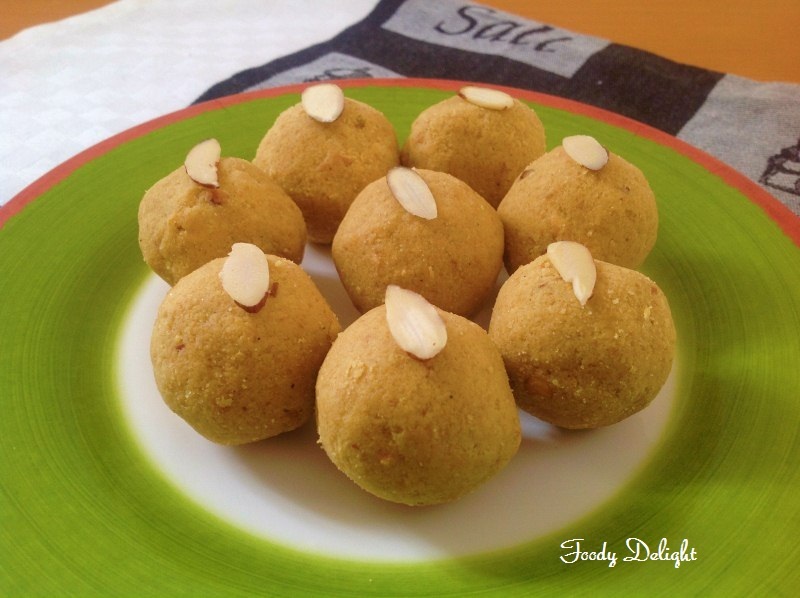 You can garnish the ladoo with raisins as shown in the images. Semolina gives the crunchy texture to the besan ladoo. You can also add chopped almonds along with cashewnuts. Once the mixture is ready, you can store the mixture in the air tight container and shape the ladoo anytime. Yummy yum laddoos..:)) looks fabulous..